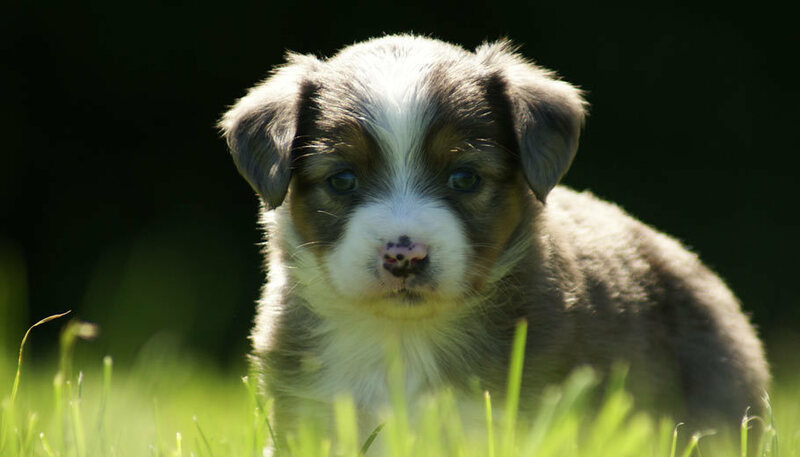 Available Mini Aussie puppies from May 2012 at Breezemore's Maine Miniature Australian Shepherds. 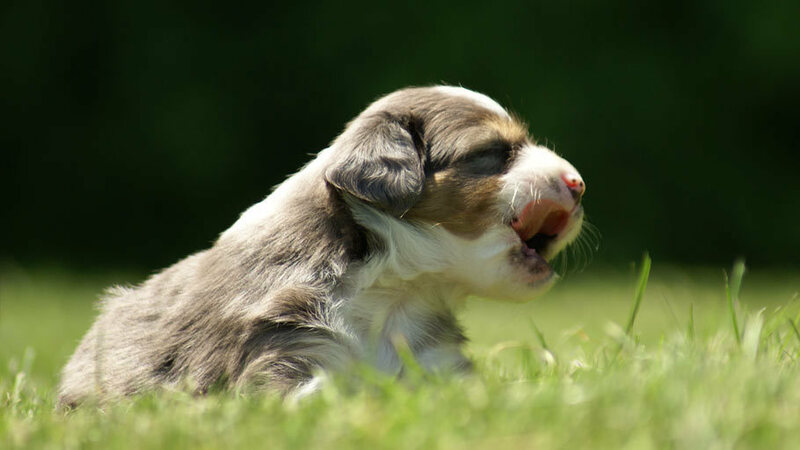 May 2012: New Miniature Australian Shepherd Puppies! 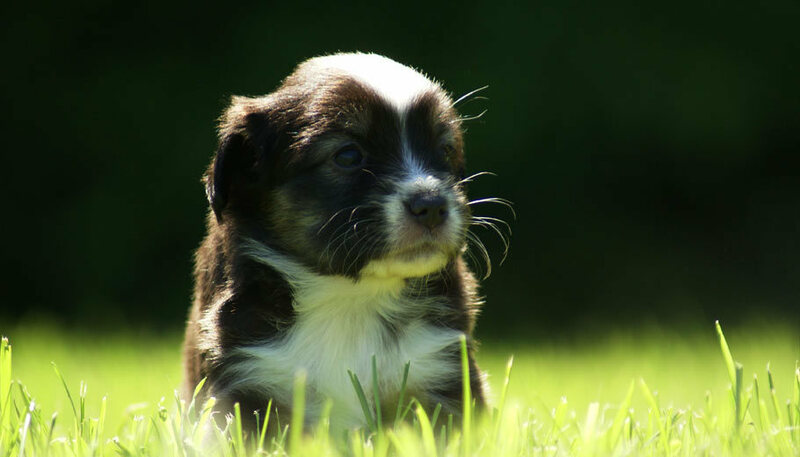 Jazzy and Eli had a litter of seven playful puppies (2 males and 5 females) on the 17th of May. These puppies will be 8 weeks old on July 12th. He is the smallest of the males, he'll be a smaller mini. He has very minimal white. To the right is an earlier/younger picture. Sold: Thank-you Donovans, they've named him Dug! The largest pup of the litter, he will likely be 16-17" full grown. He has unique merling with two colors: tan & liver. He also has a wide blaze with a half-collar. To the right is an earlier/younger picture. Sold: Thank-you Horan Family! This pup will be joining another Breezemore puppy named Chief. She's the smallest girl, she'll be a small mini, maybe a toy. She's a dark grey with a nice wide blaze and full collar. In this YouTube video she's the one who isn't quite ready for nap-time. To the right is an earlier/younger picture. Sold: Thank-you Lefebvre Family; her name is Stormchaser! Sold: Thank you Coppolas, they've named her Lucy! She's has a light grey coat with minimal merling and a 3/4 collar. She was the quickest to figure out how to escape the pen, even before the bigger guys. To the right is an earlier/younger picture. Click to enlarge. Sold: Thank you Zicolella Family; They have named her Echo! She has nice copper trim coming in and is a nicely structured pup. To the right is an earlier/younger picture. Click to enlarge. he has a nice build with bright copper trim and wonderfully symmetrical markings. To the right is an earlier/younger picture. Click to enlarge. Sold: Thank-you Epsteins! 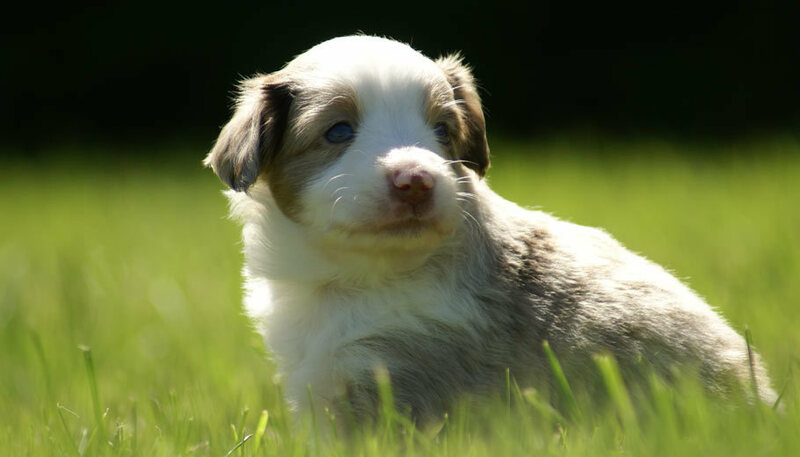 This little girl will be joining another Breezemore puppy named Copper!